I had no idea what Gawker.com was until today. A desire to read about Manhattan's media news and gossip never became part of my Internet routine. Apparently, the team buying media for the 2010 Toyota Prius is up on New York City gossip and the other properties that make up Gawker Media, that surprisingly includes the automotive blog Jalopnik. A few well-known technology blogs like Gizmodo and LifeHacker are also part of the network. 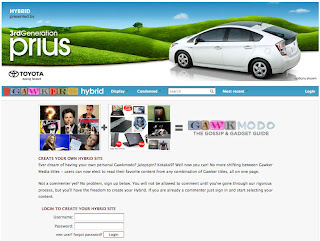 The Prius team wants you to create your own Hybrid site in the Gawker network. You can checkout My Gawker Hybrid Site, but please don't assume you'll learn a thing about hybrid or green. I couldn't choose any content feeds that were specifically hybrid related nor can I create content relevant to hybrid; instead, all I could do was choose feeds from existing media properties owned by Gawker.com. Apparently, I can someday make comments once I have "auditioned to be commenter". Audition? Maybe this is a New York thing where social media participation is like getting into Studio 54 in the late 1970s? How I audition isn't clear. I haven't received an email from Gawker explaining how the site works, nor has Toyota sent me anything after setting up my own Hybrid site. The only sense I can make about this whole site integration is the following. Maybe hybrid on Gawker is a reference to hybrid content in the sense of mixing content or different elements of news from various sources; instead of the automotive sense of the word referring to cars running two engines - one gas and one electric? Besides some odd online media decisions the Toyota Prius is doing very well with its core audience with over 75,000 pre-orders and waiting lists for the car in Japan. The national TV ads look great too with their creative concept that brings a human element into the typical green fields, blue skies and bright flowers found in just about every hybrid commercial. If there are any thoughts on what the Gawker link is that makes this work for Toyota Prius, please share. I just don't get why someone would want to create a Hybrid site on Gawker. What purpose does a Gawker user site accomplish? If it's just a portal, it's a very weak one at best. Perhaps, it's just that the MRI score for the Gawker media properties indexed high for the target consumer Toyota is going after and there really isn't much thought beyond letting users create a site. Other thoughts? Any Gawker site users out there who can enlighten this blogger? The "New GM", Believable on Day One? New fuels and old cars -- what to do?